The albergue had a nice courtyard. There were picnic tables and benches and shade provided by the surrounding building. The clothes lines, sinks for hand washing, and showers were downstairs and the water was warm and plentiful. Sadly, the beds were upstairs and every step up felt like I had giant rocks tied to my boots. But I found a lower bunk away from the door in the first room and claimed it for my own. It was near the window overlooking the courtyard. I learned how to spot the optimal bed for me. Lower bunks are easier to get into and out of than upper ones. Upper ones, however, offer more space. For me, I go for a lower bunk simply because I don’t want to have to climb down when I’m still half asleep in the morning. A bed away from the door means I’ll be away from the noise in the morning as the early risers leave. I had to wait for siesta time to finish before the local tienda opened and I could buy some food for dinner. The kitchen in the albergue was crowded – this was the municipal albergue so it was cheap and it was nice, so it was crowded. The albergue had wi-fi. I got my iPad and went through my e-mail. Some bad news caught my eye. I realized I really needed to talk to my children back in the States (remember, DH and I live in Germany). 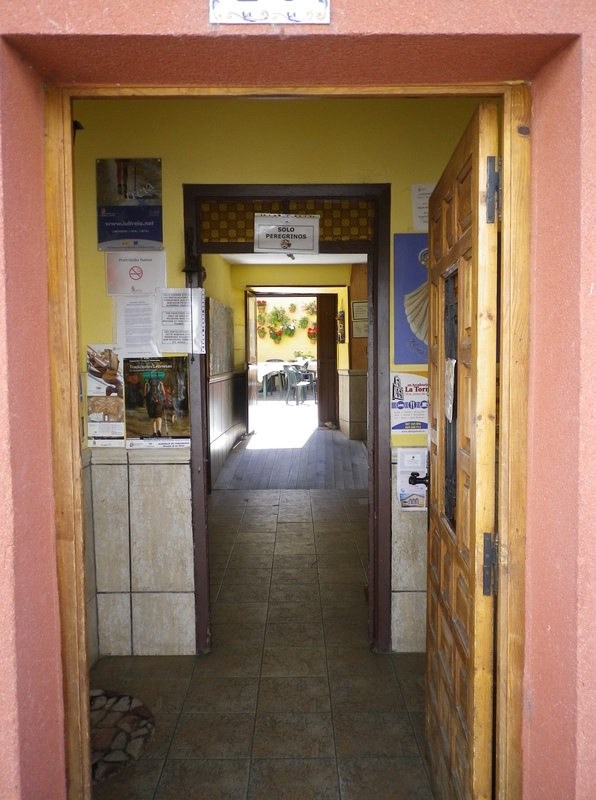 The albergue was noisy – groups were cooking together. I went outside to the street in front of the albergue and sat on the sidewalk. I pulled up Skype and connected. This was the first time I had been able to contact the U.S. since the start of my Camino. DS1 and I had a long conversation. Using my iPad, I showed him where I was, the narrow street where I sat, the bistros nearby where I could have gotten a pilgrim menu if I had wanted. Seeing pilgrims sitting on the sidewalk, back against a building, was not an unusual sight on the Camino. Things can be very basic around here. I knew I missed my children, but now I realized that I couldn’t help them. I was too far away, too invested in my journey. I couldn’t even keep up with the situation because I couldn’t get wi-fi every day, not even every hour. But as long as I could get wi-fi then and there, I stayed and we spoke. I brought the iPad inside and panned around the dining room, where a roomful of Spanish, French, Brazilian, and German pilgrims were sharing a meal. When they saw the screen, they waved, cheered, toasted, and send jolly greetings to America from this little town in Spain. The pilgrims who cheered didn’t know me or my family. Yet, because of the Camino, we all felt connected when one of us, in the middle of this crazy journey, had contact with loved ones far away. In a way, that person represented all of us who are far from home; the further, the more heartfelt the cheering. That night, Andres and Carlos were bunking in the same room as I, along with 20 other pilgrims. My Skype call had left me feeling sad and useless. There was so much I wanted to do to fix things but couldn’t because . . . I was walking the Camino. There was no one I could talk to. I shared my bad news with “the boys,” Carlos and Andres. They have children the same age as me and they understood. We talked, our first serious conversation, maybe the only serious conversation we had in the whole trip. The language barrier was significant, but they understood my distress and were cheerful, kind and supportive. I fell asleep that night, comforted by my talks with my family and with my Camino family. 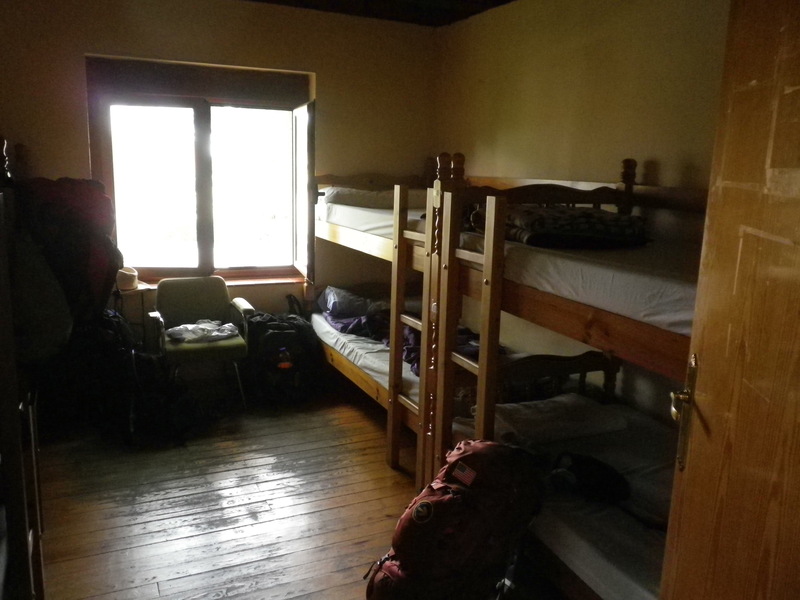 We were in an albergue that allowed pilgrims to stay until 0830. Blessings! It would feel like a hotel! The sun slowly set as I listened to the last few pilgrims in the courtyard quietly laughing and talking, sharing wine and conversation. The next morning, the people on the other side of the room couldn’t find the light switch on their side as they prepared to leave at 0545. Yes, 0545. So, they turned on the lights on our side of the room. Most of us were fast asleep. Their noise woke me up, but I understood that they were trying to get out. But the lights on! No, no, no! Couldn’t they see we were asleep?? Did they think we wouldn’t mind being awakened at that hour? Did they think we would appreciate their “wake up call?” Did they think I secretly wanted to see the stars disappear and the sun rise on the Camino? If so, they were greatly mistaken. I tried, oh how I tried, to ignore them. But, Big Tess suddenly took hold of me. Was it the conversations last night? Was it my feeling of helplessness? I crawled out of my sleeping bag. I walked over to the light switch. I gave a very dirty look to the pilgrim who had turned the light on. Making sure I could be seen by all, I indignantly flipped off the light switch with a scowl and strode back to my bed and my nice, warm, sleeping bag. I was going to get that hour of sleep, even if I had to punch somebody to get it. And then, I turned, went back, and also closed the door to the noisy hallway. From inside his sleeping bag, a hand poked out and Andres gave me a sleepy thumbs up. This entry was posted in camino de santiago de campostella, Saints, Spain, Travel and tagged Camino de Santiago de Campostella, family, Saints, Spain, tired, Travel. Bookmark the permalink. Hey, Bill, thanks for the nice comment. Stuff back home continues to be messy. There’s nothing to be done about it, though. Being a military family, we’re always out of the country when things happen that we should be around for – weddings, funerals, graduations, births, hospitalizations. I guess that, for those of us who choose a wandering lifestyle, the advantages outweigh the disadvantages. Sorry about your Dad, that situation, and all it entailed. PS – You’re one of those early risers, aren’t you?? LOL! Good for you Kathy! Sometimes people can be very inconsiderate. Why didn’t they bring headlamps? They were lucky they didn’t get shouted at! I hope everything now is sorted with your children back home. It’s horrible when stuff like that happens and you’re away, and there’s nothing you can do about it. You feel so helpless. But… you can’t sit around at home all your life waiting for something bad to happen. It’s the nature of the life that we lead that we all travel from time to time. I was in New Orleans making a movie when my father died in Australia.